For years I have had awful nails as well as them being short and me constantly picking them, the skin around my nails had also been completely ruined by me. When I left my job two months ago (where I couldn't wear anything on my nails) I decided to make an effort to grow them. I now get so many compliments on how my nails look and love rather than loathe painting them! 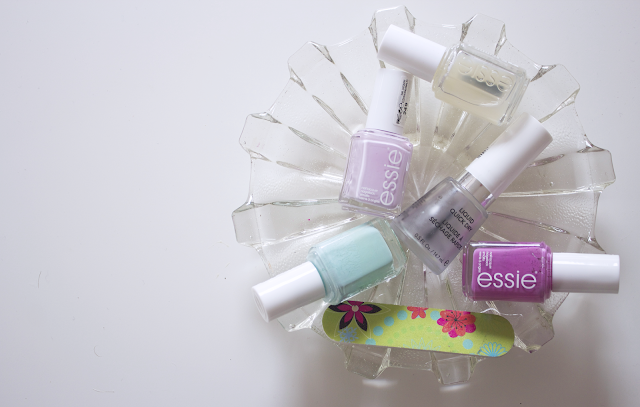 Here are a few of my tips to grow your nails and keep them looking lovely! This will stimulate growth as well as avoiding chapped and dry skin on your hands, this works great for me as it softens any hard skin around my nails which stops me picking at it and making it sore! Always Apply a Base Coat! It's important to always apply a base coat or strengthener under nail polish or when you have no polish on. I use one from Essie as my nails can bend when they get long, so this makes sure they are stronger and less likely to break. It can also ensure your nail polish stays on for longer. I trim my nails every so often to make them all an equal length, while long nails are nice, I try not to make them too long as they can break in awkward places, making it painful! Also file them, a rounded shape is good as it means they are less likely to get caught on things and snap off. The one thing that actually stopped me from picking my nails was painting them. I wasn't allowed to have nail polish on my nails for work, so for nine months, they were barely painted! When my nails are freshly painted and neat, I don't pick them as I don't want to ruin them! Another tip if you have the money is to pay for a manicure, if you are paying to have it done; you are less likely to ruin them. If you bite your nails, chew gum to stop yourself doing it or if you're like me and tend to pick them, buy a stress ball or something to hold, to stop you from the nasty habit! Do you have any tips for growing nice nails? This was a great post to read, and is definitely an area I need help in!